Whether you’re a buy-and-hold investor or looking for a quicker return building a new unit and selling it, the ability of a brand to expand over time obviously influences your investment decision. But how do you evaluate that ability? Is there a way to determine which brands have the best opportunity to grow their brands and which might struggle? The S-II ratio is a simple equation that combines both the risk and reward of starting a unit into a number that’s easy to understand. 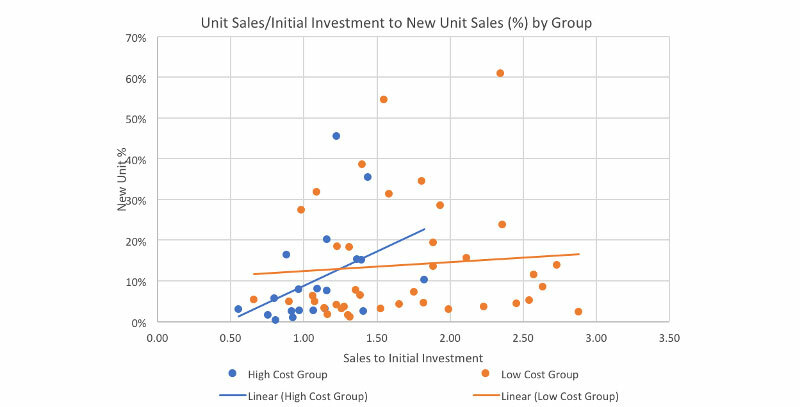 As part of a recent client analysis, one of our senior analysts, David Swift, examined the relationship between the S-II ratio and new unit development (as a percentage of existing units) to serve as a proxy for brand growth. Any investor would expect that unit sales and expenses will affect the likelihood that a potential franchisee would want to buy a unit. However, we found that relationship is more complex than it appears. We looked at 70 QSR and sit-down restaurant concepts for this analysis. Brands had to have at least 10 existing units to be included. 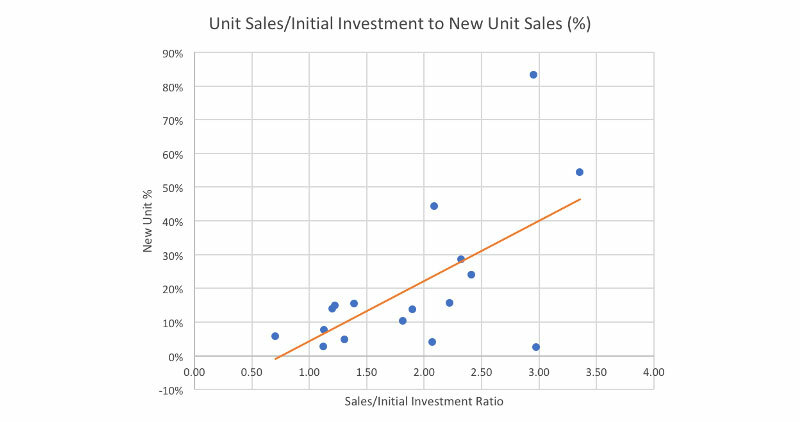 While there was always a positive relationship between the S-II ratio and new unit development, the slope of that line and the accuracy of that relationship were very much dependent on the size of the initial investment. The statistical baseline showed a positive slope of 0.044 with an R2 of 0.18 and p-value of 0.16. 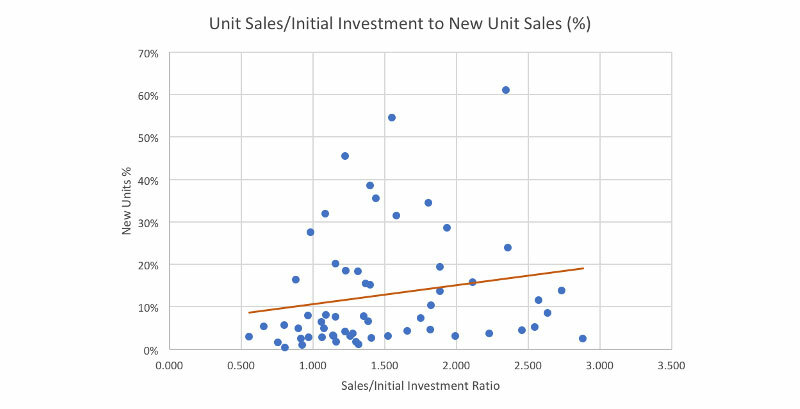 What this means is that while there is a positive relationship, it does not explain much about the ability to sell a new unit, and we can’t be confident in its predictive value. To understand the power of this ratio we need to find something more to explain the relationship if economic common sense is to prevail. Perhaps rationality is affected by the investment level, the theory being that the higher the initial investment, the likelihood that economic rationality will reveal itself, while lower investment levels might be more prone to emotional decisions. We split the brands into two sets around average initial investment: those with higher average initial investments and those with lower average initial investments. The dividing line was approximately $1.4 million. For the high investment group, the slope increased 0.16, while the R2 increased to 0.41 and the p-value decreased to 0.06—all of which means that we now can associate standard economic investment logic for nearly half of the new unit investment decisions and are more than 90 percent confident the logic is valid. The resulting regression gives us a slope of 0.17, an R2 of 0.62, and a p-value of 0.007. While the slope hasn’t changed much, the value of the S-II ratio now informs more than 50 percent of the decision to buy, and we can be more than 99 percent confident in the relationship. Simply put, all this math means that the higher the S-II ratio, the more units these brands were able to add, and brands with an improving S-II ratio are poised to increase new unit sales the most. As an example, imagine two brands, both with 100 units and the same initial investment of approximately $1.5 million. Brand X has aN S-II ratio of 1 while Brand Y has a S-II ratio of 1.3. Based on actual performance of 70 brands in this analysis, the S-II ratio equates to Brand Y adding 5 more units in the next year than Brand X. Over time this advantage would grow at an increasing rate as the gap in units increased. There you have it. 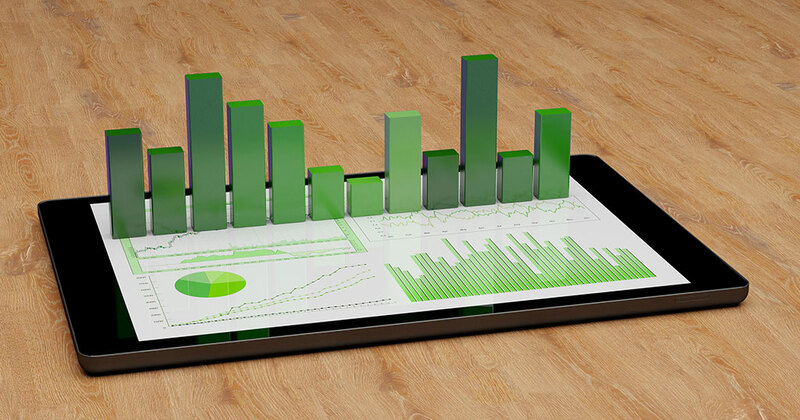 Unit performance matters and can be measured in actual system growth differences. “How much can I make?” really does matter, and the differential impact isn’t just related to how good a franchisor’s CDO is at selling.